Did you know, our website is jam packed with product information? Nestled under the product picture, you can find out the tech specs, materials, case sizes and pricing options. I was asked if our Clear Round Deli Pot would take a hot fill. The short answer is yes, they do! If you’ve ever splashed hot fat on your skin, you know that stuff is actually hotter than lava. So I did what I love doing, I roasted a chicken and drained the juices straight into a container to see what would happen. It didn’t melt, collapse or do anything other than sit there with stock in it. Perfect. 79°C is 175° Farenheit – hot stuff! Unusually for me I didn’t burn myself this time, and I left the stock to cool a bit before moving it. 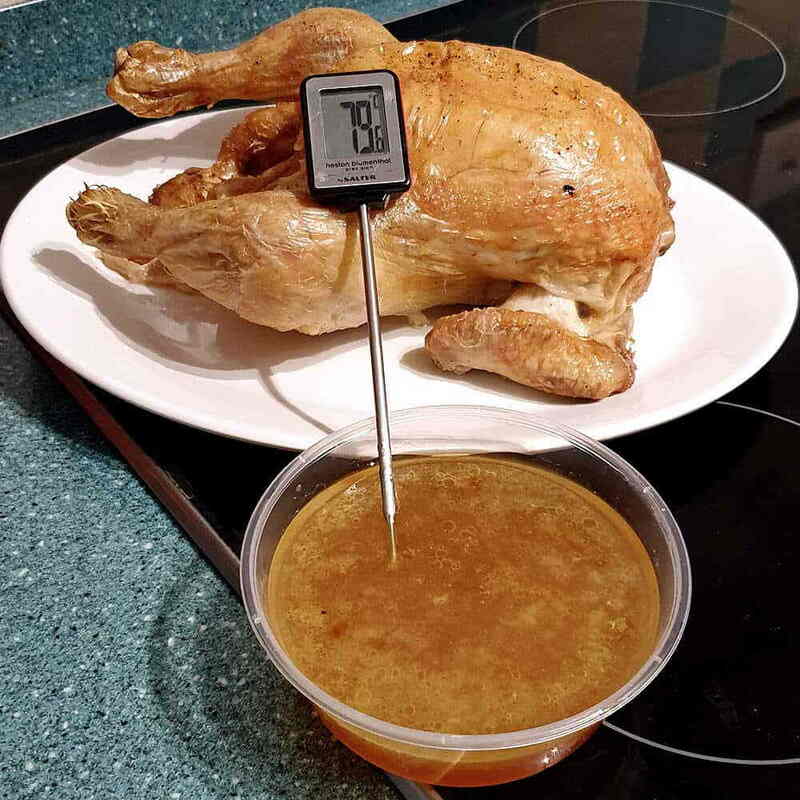 Every kitchen should have a thermometer, essential when checking your chicken. This container is part of a bigger range; We also stock a 340ml, 468ml, 614ml and 738ml round container too, and they will all behave in the same way. I’ve also tried this test with the Tamper Evident Containers we stock and they all cope very well too. What’s more, they are freezer safe, but don’t forget to label your container.